Blueberries are the superstars of the berry world. Nothing else comes close. 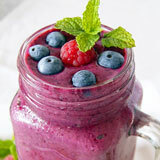 According to the USDA, blueberries rank number one in terms of antioxidants. Antioxidants are essential to good health as they help protect cells from damage which can weaken the immune system and lead to disease. They are also an excellent source of several other important nutrients. One cup will give you nearly a quarter of your daily recommended dose of vitamin C and 14% of your daily fiber intake. They also have high levels of vitamin K and manganese. As if that wasn’t enough reason to eat them, one cup only contains 84 calories. Blueberries owe their purplish hue to their high levels of anthocyanin, an important group of plant chemicals that act as antioxidants. 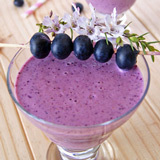 The health giving benefits of blueberries cannot be overstated and there is no better way of enjoying their benefits that with a blueberry smoothie recipe. 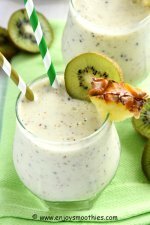 Combine them with other berries or fruits, or simply add a banana and some yogurt or milk for a really, quick and simple smoothie. If buying fresh look for berries that are completely blue with no red tinge. Berries should be completely ripe when purchased, as they do not continue ripening. Avoid anything that is soft or moldy looking. Store your berries in a suitable container covered with plastic wrap. They should be kept refrigerated and will last for up to two weeks if freshly picked. Don’t wash your berries before refrigeration, as moisture will accelerate deterioration. 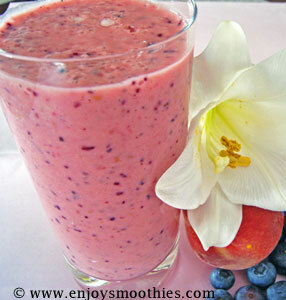 Place the blueberries, raspberries, banana, yogurt and almond milk into a blender and blend for 1 minute. 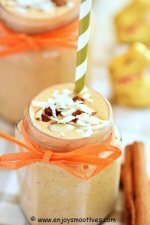 The smoothie should be smooth and creamy. 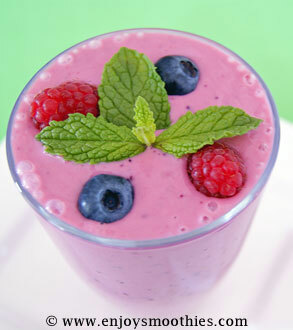 Pour into a glass and decorate with extra blueberries and raspberries. 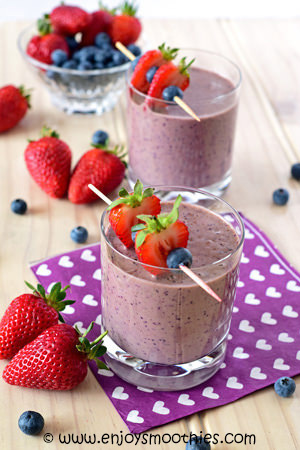 Remove the green stem from the strawberries, slice then place into your blender. 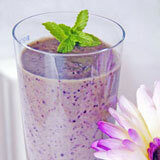 Add the frozen blueberries, banana, almond butter, almond milk and cacao. 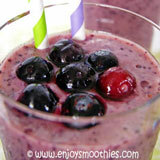 Blitz on high for several minutes, or until your smoothie is nice and creamy. 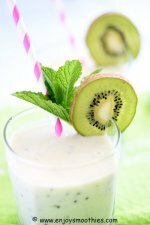 Place all the ingredients into a food blender and blend for 1 minute. Pour into a chilled glass and serve immediately.